Chief Justice of Jamaica, the Honourable Mrs. Justice Zaila McCalla, OJ promoted the positive far reaching impact of the Drug Court Programme in Jamaica over the past 13 years. 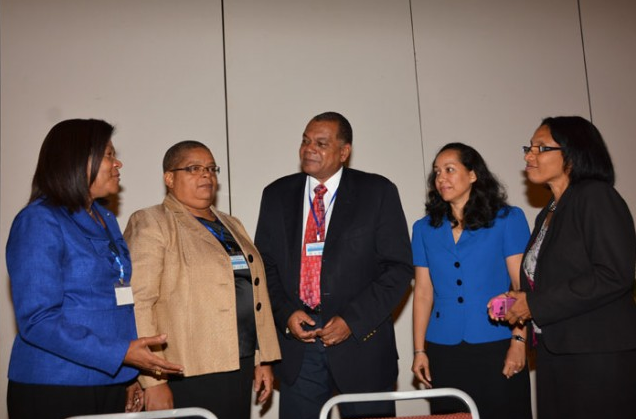 She made her remarks at the opening of a training workshop at the Hilton Rose Hall in Montego Bay on September 18 on Drug Treatment Courts and other problem-solving approaches to justice. The Chief Justice said the training is “very timely and relevant, as we seek to promote alternatives to the incarceration of drug-dependent offenders”. Mrs. Justice McCalla pointed out that the issue of drug abuse must be tackled from all sides, and that the court has a significant part to play in that process, by helping to fight the grossly negative effects on the citizenry and the nation. She noted that that the approach to the treatment process is a holistic and therapeutic one, which is geared towards improving the social, vocational, educational, and economic conditions of the participants. Mrs. McCalla pointed out that reducing recidivism, promoting abstinence from substance use, and encouraging and assisting participants to lead productive lives, free from drug addiction was the aim of such a programme. “The programme provides an opportunity for drug-dependent offenders to benefit from court supervised treatment. On successful completion of the programme, participants become eligible for graduation … it is a wonderful experience to listen to testimonies of the graduates regarding life-changing opportunities of being involved in the programme,” she said. While highlighting the many successes of the porgramme, the Chief Justice shared the vision of the Drug Courts, to bring its service within reach of every eligible citizen of Jamaica, despite the many challenges being faced. Corporate Area Resident Magistrate, Stephanie Jackson-Haisley, in hailing the training, said it is clear that innovative and new strategies must be pursued to address some of those problems facing persons, who interface with the justice system. “Rather than trials in all cases, referring some cases for alternative strategies (and outcomes) would no doubt impact on the backlog of cases in the court system,” she argued. The 3 day training event was attended by approximately 60 professionals including judges, psychiatrists, attorneys-at-law, clerks of court and drug enforcement personnel. It was organized by the Inter-American Drug Abuse Control Commission, the Secretariat for Multi-dimensional Security of the Organization of American States in collaboration with the Government of Canada, the Ministry of Justice, Health and the National Council on Drug Abuse (NCDA). It forms part of the overall strategy to continue in the education of persons already participating in implementing the drug court model in Jamaica, while providing general training for those new to the field.